Singer and songwriter Barry Louis Polisar has been writing and recording songs since the 1970s for generations of kids. But after Polisar’s “All I Want Is You” was featured in the movie Juno, Polisar became more well known. In this two-CD tribute album, a wildly diverse bunch of worthy performers (some of whom loved Polisar’s tunes while growing up) covers 60 of his songs (including three versions of “All I Want Is You”). Some common elements emerge: whimsy, wordplay, and good nasty fun. Many titles are punchy song summaries–“My Brother Thinks He’s a Banana,” “I Eat Kids,” “Bad Guys Broke into Our Car,” “Never Cook Your Sister in a Frying Pan,” and “I Need You like a Donut Needs a Hole”–to name a few. The names of various representative bands sound a bit “Polisarian,” including the Radioactive Chicken Heads, Rutherford B. Hayes Is Dead, Haunted Cologne, Kid Kazooey, Ham and Burger, the League of Space Pirates, and the Boogers. The 60 tracks zip through musical territory, including rock, metal, rap, country, klezmer, jazz, and traditional Irish. The arrangements are invigorating, and it’s especially fun to hear some songs covered more than once in starkly different renditions. Be sure to check out “Don’t Put Your Finger up Your Nose” sung entirely in Yiddish and sounding like a German cabaret tune. Highly recommended for young and old alike. Barry Louis Polisar is an author and songwriter who has written hundreds of children’s songs, as well as twelve children’s books. Polisar’s music is akin to the left of center writings of Roald Dahl or Shel Silverstein, so parents should be forewarned as much weirdness occurs. Yet this is precisely the kind of oddball, nonsense humor that young kids adore. This sixty-song, two-disc tribute is an amazing gathering of brilliant talent from around the country (and the world), performing songs in genres as diverse as hip-hop, folk, jazz, grunge, punk, klezmer, and rock. Highlights include the group Rutherford B. Hayes is Dead (from Oak Park, California) garage band inspired cover of “I’m a Slug,” The Vespers (from Nashville, Tennessee) sweet mountain harmonies on “Barnyard Stomp,” and the wonderfully named Radioactive Chicken Heads equally strange covers of songs such as “I Eat Kids” and “I Wanna Be a Dog”. Depending on your parenting style, Polisar’s music might be too irreverent for you. However, if the idea of a kid’s version of Frank Zappa or Captain Beefheart sung by some of the best indie bands around doesn’t scare you, then this might become your family’s favorite children’s album. When I started in kids’ radio in 1983, there weren’t many contemporary artists producing original music for my audience. Those early days of Raffi’s influence created songs about “Baby Beluga” and awareness of a world beyond one’s own borders. Then came Barry Louis Polisar, whose approach to kids’ music reflected the anarchy of childhood. Polisar created music about real-life kids and their real-life battles against the adult world. Songs like “He Eats Asparagus, Why Can’t You Be That Way,” “Don’t Put Your Finger Up Your Nose,” “Never Cook Your Sister in a Frying Pan,” and “I Got a Teacher, She’s So Mean” reached kids of the ’80s by appealing to the inner Tasmanian Devil in each of us. Polisar’s songs were delivered by the composer’s own whiny, reedy, ever-young sounding voice and his acoustic guitar. Frankly, listening to a whole Barry Louis Polisar album could make your teeth hurt from the sound. But the songs were amazing mixes of grown-up literary references (influenced by Polisar’s mentor/uncle, a New York poet) and kid-friendly silliness. Polisar brought families together with deliciously subversive musical humor. Many kids who grew up on Polisar have now honored his influence with We’re Not Kidding! A Tribute to Barry Louis Polisar. It’s a brilliant two-CD collection interpreting Polisar’s songs in a wide variety of styles. This CD isn’t narrowly aimed at kids, but it includes current kids’ artists like Ham & Burger and The Boogers. Hand this to a fan of alternative rock without mentioning Polisar’s kids’ song roots, and they’ll never know the difference. His song “All I Want Is You” on the Juno soundtrack ignited interest in Polisar, who has continued producing books and music and has always maintained an exhausting school touring schedule. We’re Not Kidding! opens with The Vespers’ folkie rhythmic take on “All I Want Is You,” turning it into a simple love song. Deleon follows with a haunting, heavily-produced Led Zeppelin/psychedelic approach to “My Brother Thinks He’s a Banana,” (“he’s really quite intelligent, he’s read the Bhagavad Gita…”). “I Eat Kids” gets a rock treatment from The Radioactive Chicken Heads that will get you singing along: “I stopped eating animals, and I’m glad I did. But I still get my protein ’cause I eat kids.” There have always been nervous nellies complaining about Polisar’s humor. Luckily, kids understand he’s not actually advocating eating children, and appreciate his imaginative outlook on life. In a world where “Bad Guys Broke into Our Car” may be a real-life occurrence, Los Huevos use spirited rock to remind us “it’s just stuff.” Slide guitar sweetens the country feel of Rebecca Loebe’s “You’re As Sweet as Sugar on a Stick,” It’s one of many love songs on the album, expanding Polisar’s original parent/child intentions to include more grown-up affections. With enormous variation in musical styles and performers, We’re Not Kidding” honors the best part of Barry Louis Polisar–his songwriting. By bringing their own originality to his songs, the kids who grew up on Polisar do right by him as adults. Kathy O’Connell is a contributing writer to MetroKids and host of the Peabody-award-winning Kids Corner, weekdays 7-8pm on WXPN 88.5 Radio. This article appeared in the February 2010 issue of MetroKids. A wonderful family-friendly tribute album to a long-standing kidfolk icon. Over 35 years on the road and in the studio, Barry has made a name for himself as an award-winning kids entertainer and a strong proponent of imagination and literacy; his songs have been featured on NPR, School Library Journal, Newsweek, and on endless rotation on my CD player, and their titles speak for themselves: current favorites in our house include My Brother Threw Up On My Stuffed Toy Bunny, I Wanna Be A Dog, and I Eat Kids. Now, in recognition of his years of service to a rising generation of children, a host of international artists and family bands, many of who grew up listening to these hilariously warped kidsongs, have come together to pay tribute to Polisar and his surprisingly vast catalog. And just as I really recommend Barry’s endearing originals, I’m putting the two-CD tribute We’re Not Kidding at the top of my stocking stuffer list, and recommending you do, too. It’s hard to describe the sprawling tribute that is We’re Not Kidding. Where Barry’s original works tend primarily towards the kind of cheerfully ragged acoustic rock that typifies some of my favorite kid’s albums, the sixty songs here run the full genre gamut – there’s grungy hard rock, twangy country, klezmer, ska, Zappaesque electrofolk, girl-group harmonies, the odd samba, and a healthy dollop of acoustic indiepunk and singer-songwriter anti-folk. But despite the vast sound spectrum, a closer listen reveals several unifying elements here beyond Polisar’s direct, imaginative silliness. To wit: these songs are all short and weird, almost universally experimental and wobbly-voiced, highly gleeful, and – regardless of genre – predominantly steeped in a ragged, one-take sensibility. Put it all together, and it’s like a complete box set of fun off-genre bonus tracks from the entire SXSW cadre. Or like someone decided to put together a heroin-punk and mid-nineties New Zealand Underground compilation for kids, and every artist took a different approach to the problem, with some choosing to take up a more kid-friendly genre mantle, others stripping their sound down to the acoustic roots, and the rest figuring that kids would like punk, too. While the attention given to children’s music typically focuses on the newer artists, I think it is important to remember some of the pioneers of this genre. And no one represents a “founding father” of the genre better than Barry Louis Polisar. The success of this song led to many of his old fans being reunited with a musician they remembered fondly from their youth. Aaron Cohen, lead singer of indie group The Radioactive Chicken Heads, was so influenced by Polisar as a kid he decided to pitch the idea of a tribute album to other artists. What resulted was the 60 song, 2-disc set, We’re Not Kidding! A Tribute to Barry Louis Polisar. Artists attached to the project interpret his songs using their own styles. Hip-hop, electronica, folk, jazz, Klezmer, and bluegrass are just a few of the genres touched upon by the international group of participating musicians. Any listener approaching this album, each with his own distinct musical pallet and preference, is sure to find handfuls of gems to add to his iPod. An instant favorite in our house was Nashville trio Vesper’s version of “All I Want Is You,” the aforementioned song that brought Polisar back into the spotlight. We also enjoyed DeLeon’s take on “My Brother Thinks He’s a Banana” with goofy-good lyrics on top of a sophisticated indie-rock sound that mixes in Sephardic music. NYC-based Ham and Burger’s delightfully nonsensical “Don’t Put Your Finger Up Your Nose” had the type of funky electronica beat that is always a hit. There was even a rockabilly-style version of “Never Cook Your Sister in a Frying Pan” from Robbins In A Tree-O that had us appreciating a genre we usually don’t give much thought to. And, of course, what would a tribute album to a kid’s musician be without some family music talent on board to honor the artist? Grammy-nominee and Kidzapalooza / Austin Kiddie Limits creator Tor Hyams contributes to the album as does punk rock kindie act The Boogers and acoustic-rock duo Key Wilde and Mr. Clarke. This album is truly a delight for older indie-rock lovers and their music-loving offspring. My wife and I get to explore and discover new bands and their different sounds while my daughter enjoys the genre-jumping, comical lyrics and non-stop fun. Best of all, a long overdue tribute is paid to an artist who inspired many of the modern-day musicians we love – both in and out of the family music genre. If you’re into quirky independent cinema, chances are you’ve already seen the opening title sequence from the film Juno. The composer and performer of this song is Barry Louis Polisar, and many folks saw the success of this song–the album won a Grammy for best compilation album–as an overnight success, which it would have been except for the fact that he wrote it about thirty years ago. But the fact is that Polisar is now enjoying an increase in popularity, something well deserved after three decades of entertaining, educating, and singing for kids. Now some of those kids, all grown up, are returning the favor. In September I wrote about the announcement of a tribute album called “We’re Not Kidding.” The album was finally released and it’s been well worth the wait. Under the guidance of Radioactive Chicken Heads singer Aaron Cohen, a reported forty-five musicians (including some appearances from Polisar himself) have gotten together to rework and record sixty tracks of Polisar’s music. The musicians include a few I’ve heard of before, like Tor Hyams, but for the most part since music isn’t my main professional focus it’s introducing me to a whole bunch of people who warrant further investigation: the Vespers, J-La, Deleon, Kid Kazooey, Elizabeth Street, Alyssa Robbins, Rutherford B. Hayes Is Dead, Purple Mums, Rebecca Loebe, the Boogers, Tom Vincent, Le Page, Ham & Burger, Jeff Forrest, Haunted Cologne, the Brothers Vilozny, Bonnie Phipps, League of Space Pirates, Your Little Pony, and of course the Barry Louis Polisar Self-Aggrandizement Choir (who sing “The Tushie Song”), plus dozens of others. One other factor leaning this toward older kids, though, is the vocabulary, which can be pretty challenging. Much of it might go right over kids’ heads, but on the other hand it can help them learn and stretch in ways that they might not otherwise; I can still remember a good old Elvis Presley song sending me to the dictionary when I was about ten to look up what a “ghetto” was. They Might Be Giants and other good lyricists do this, and Polisar seems right at home in that crowd. Besides that the rhymes are catchy and often funny, something making this good listening for parents as well as for kids. The fact that Juno was in no way a kids’ movie speaks to the cross-over appeal Polisar’s work has. I’d like to thank Polisar for letting me know about all of this and all of his personal interest in my work as well; his interest and warmth in the few emails we’ve exchanged has gone way beyond that of a musician trying to promote his new album. As I’ve listened to the music I think that kind of attitude has carried over into his own work as well. At the end of the day it’s a compilation album and is therefore a mixed bag, but overall the album’s quite excellent and well worth checking out. I have a new passion–in music, that is. His name is Barry Louis Polisar and he writes the absolute best songs for kids–songs with snarky lyrics, songs about love, songs about dogs (and cats and fish and birds), and songs that are somewhat, ahem, rude. How could a kid resist? “Don’t put your finger up your nose, ’cause your nose knows it’s not the place it goes,” “Watch out,” “Never cook your sister in a frying pan” and “Shut up in the library…” are, of course, timeless pearls of advice, while “The Alfabet Song” (Frankie and Rufus) is an alphabet song with an attitude–appealing to kids who already know their alphabet and appreciate what all the nasty things in the song are. Other songs tell stories (“I’m a Three-toed, Triple-eyed, Double-jointed Dinosaur” performed by Bonnie Phipps), voice a familiar complaint (“I’ve Got a Teacher, She’s So Mean,” Kid Kazooey) or express loving sentiments for a number of things–people, pets, stuffed toys. Polisar is in a class of his own, writing unique lyrics that appeals to kids (as well as inner-kids) and music that invites movement. “We’re Not Kidding!” is bright, lively, sometimes gross, humorous, and a lot of fun. It’s a collection that every cool family should have in their music library. Bottom Line: Would I buy We’re Not Kidding? I absolutely would–I love it! When does a children’s recording artist know he has really had an impact? Perhaps when his listeners grow up and record a full CD paying homage to him. Ask Barry Louis Polisar, the Maryland songwriter and performer who has accrued scores of young fans since he started recording his eccentric songs and playing school concerts three decades ago. For Polisar, ‘We’re Not Kidding’ CD stacks up as a full-grown homage. The two-disc set features cover versions of some 60 Polisar songs, including “Shut Up in the Library,” “I Eat Kids” and “My Brother Thinks He’s a Banana.” They’re performed by a variety of independent and children’s-oriented artists like Frankie and Rufus, Ham & Burger and Elizabeth Street. Hollywood film director Jason Reitman, Polisar later learned, had been searching for a song called “You’re the One I Want” for the film and accidentally typed in “All I Want is You” when he was searching for the song on iTunes. Up popped Polisar’s song of that name, and before Polisar knew it, his music was being showcased in one of 2007’s biggest films. Instead, it was used over the opening credits, which gave Polisar a very unexpected spotlight. All of a sudden, more people were buzzing about his music on the Web and more artists were volunteering to be part of the tribute album, which expanded into a double CD set. He also performs a lot – though not at typical concert venues. Instead, Polisar can be found performing in schools. Over the years, he has played school concerts “all across the United States,” he says, “from Alaska, all the way to New England, down into Florida, the Midwest. Imagine this: a children’s song about potty training to the tune of “Waltzing Matilda” sung as a jig by the Guinness-loving, kilt-wearing Michael O’Brian Band from Altoona, Penn. This is just one of the spectacular pairings from a two-disc tribute album released this month that pays homage to children’ singer-songwriter Barry Louis Polisar. Most of the 60 songs, penned by the Brooklyn native throughout his 35-year career, are recorded by artists who loved the songs when they were kids. Polisar, who spent his earliest years in Brighton Beach and attended P.S. 225, is more recently best known for ‘All I Want Is You,” the song that plays during the opening credits of 2007’s Juno. Compiled over the last few years by Aaron Cohen, a childhood fan of Polisar’s from Los Angeles, We’re Not Kidding: A Tribute to Barry Louis Polisar is a collection of talent from across the U.S. and as far away as Greece. The musical style ranges from hip-hop and folk to jazz, klezmer and rock. Some lyrics have been translated into Spanish, French and Yiddish. Years ago Cohen first sent Polisar a version of the song “Underwear” recorded by his rock band The Radioactive Chicken Heads. “I just about fell on the floor laughing,” says Polisar. “I love that version. It’s so fun.” They stayed in touch, and later Cohen proposed the tribute album. Brooklyn-based DeLeon, fronted by Dan Saks and influenced in part by Sephardi Jewish cultural tradition, covered “My Brother Thinks He’s a Banana” and “My Name is Hiram Lipshlitz” for We’re Not Kidding. Another contributor is Jennifer Hall, who contacted Polisar a few years ago looking for his original tracks. Hall was his first “cover girl”–her parents put her on Polisar’s lap as an 18-month old and that photo became the cover of his first album. She is now a musician in Los Angeles. Deborah and the Nogoodniks–comprised of a doctor, a lawyer, a psychotherapist, a scientist and a university financial executive, all Brooklyn residents–contributed “Shtek Nit Dayn Finger in Der Noz,” a Klezmer version of “Don’t Stick Your Finger Up Your Nose.” Deborah Berman, the psychotherapist, says she was inspired by a little boy in Crown Heights who couldn’t seem to stop picking his nose. “He was becoming increasingly distraught over everyone criticizing him for nose picking at shul, in yeshiva, at Shabbat dinner,” she says. “One day he was in my office in tears, completely frustrated about the whole thing and I suddenly thought about Polisar’s song. I began to recite it to him, but the Yiddish interpreter, not understanding that I was trying to give him a chance to laugh about the issue, translated the lyrics as a scolding, dark tale of warning. He has been a regular musical performer on “The Learning Channel,” starred in an Emmy Award-winning television show for children, and performed at the Kennedy Center. What can be better than having your song from a 30-year old album plucked from obscurity and used in the opening credit sequence of an Oscar-winning movie and Grammy-winning Soundtrack album? How about being re-united by fans who had your records when they were kids and now–as musicians–have gone into the studio and recorded sixty of their favorite songs for a 2-CD Tribute Album! During the 1970’s, 80s and 90’s, Barry released a dozen recordings of his original songs for children and gave concerts in elementary schools and public libraries. His songs were recorded by everyone from Sesame Street’s Big Bird to an indie punk rock band called The Radioactive Chicken Heads. After his song appeared in the film, musicians from around the world began discovering and recording his songs. Aaron Cohen, lead singer of the Chicken Heads, credits Barry’s music as a major influence in his own career and pitched the idea of a Tribute Album to other artists, ultimately choosing sixty songs for this 2-disc set. Polisar continues to sing for children and families, visiting schools and libraries all over the US. On this phenomenal two-disc set, 40 artists (including Polisar himself) perform 60(!) Polisar cover tunes. Not every track is an absolute winner, but there are enough unquestionably great songs on here to fill several regular-length albums. We’re Not Kidding! is a smorgasbord of musical styles as well. You’ve got indie acoustic (“I Want to Be Your Baby,” by Pages), punk rock (“I Eat Kids,” by Radioactive Chicken Heads), country (“With a Giggle and a Hug and a Tickle and a Kiss,” by Alyssa A. Robbins), Celtic (“Potty Training,” by the Michael O’Brian Band), klezmer (“Don’t Put Your Finger Up Your Nose,” by Deborah Berman & the Nogoodniks), ska (“Bad Guys Broke into Our Car,” by Los Huevos) and more. Some songs appear in the set twice, recorded by different artists in remarkably different ways. “Never Cook Your Sister in a Frying Pan” is interpreted as both a goofy honky-tonk number and as industrial electronica. “I Need You Like a Donut Needs a Hole” appears in both ballad-rock and synthpop forms. “All I Want is You” gets multiple treatments, too: once as acoustic alt-rock, once with a Motown twist, and once in French with a zydeco spin. The fact that each version can come off equally good is a testament to Polisar’s songwriting. And speaking of that writing… In case you couldn’t tell from some of the titles, Polisar is a bit subversive as a children’s musician. But his naughty nature comes out in the form of some very funny lyrics. And when he’s not writing about underwear or hating to brush his teeth, he manages to pen some of the loveliest love song lyrics you’re likely to ever hear. So if you still don’t know the answer to the question I opened this review with, you owe it to yourself and your kids to listen to the album and find out. Barry Louis Polisar has been singing to kids for a very long time. Over the course of his nearly 40-year career, Polisar has performed just about everywhere, from schools and libraries across the United States and Europe to the White House and the Kennedy Center. He’s heard his music on Sesame Street and in TV commercials. But it wasn’t until 2007, when his song “All I Want Is You” was featured in the opening credits of the film Juno, that he could feel like he’d hit the big time. The soundtrack to Juno sold over a million copies and propelled Polisar to new heights, including a Lifetime Achievement Award from the Children’s Music Web. He probably thought it couldn’t get much better than that. Last December, though, he did something even more impressive. He joined that very small group of musicians who have been deemed by others to be worthy of a tribute album. And a double-disc album at that! The cool thing about the 60-track We’re Not Kidding! 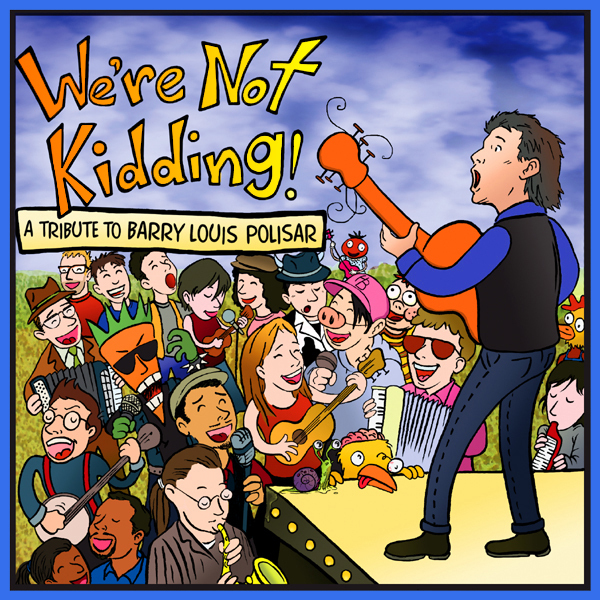 A Tribute To Barry Louis Polisar CD set is that the various contributors to the project are not kids’ performers, so their sound is decidedly more adult, with styles including hip-hop, folk, jazz, and rock. There’s even a Klezmer version of “Don’t Put Your Finger Up Your Nose” sung entirely in Yiddish. Even with all the different indie artists and their individual styles, the whole thing works really well. That’s due to Polisar’s songs, which have always been extremely unique in the world of children’s music with their wildly imaginative lyrics. Songs like “I Need You Like A Donut Needs A Hole” and “He Eats Asparagus, Why Can’t You Be That Way?” are unlike anything else out there. Most of the bands and singers on this CD grew up listening to Polisar, and cite him as a big influence, so they know and love these songs. You and your kids will love them too. We’re Not Kidding is literally overflowing with fun, and funny, music that will have you tapping your feet and singing along. It’s good for all ages, even unsuspecting teenagers who will appreciate the Juno connection. This is a super-delightful two-fer by a legion of musicians and groups who have long dug the sonic and writerly output of Barry Louis Polisar, a gent whose oeuvre is rather astonishing, prolific. Having printed up 9 volumes with such titles as “Peculiar Zoo” and “The Snake who was Afraid of People”, most of them carrying the ultra-cool cartooning of David Clark–a hilarious amalgamation of Shel Silverstein, Ronald Searle, and Hunt Emerson–Polisar abetted the whole schmear by cutting 7 music discs, this being #8. “We’re Not Kidding!” is kinda like that disc put out long ago that tributized Saturday morning cartoon themes, in that case wrecked, sent up, and lovingly mangled by a gaggle of punkers, new wavers, and assorted other new school genre-mongers. “We’re Not Kidding” isn’t exactly a punkorama, but it oft has a lot of the same energies, lampooning jocularity, and, here, top drawer production values and creativity. Yeah, things are rocky enough but they readily jump into jazzy, swingin’, folky modes too, then turn right back to the raucous and brash (Donuts, The Alfabet Song, etc.). Toss in Spike Jones, the Limelighters, Devo, slinky cabaret…and, yow!, even klezmer and Danny Elfman influences by such eclectic ensembles as The Space Pirates, Ham & Burger, Kid Kazooey, The Radioactive Chicken Heads, and, hmmm, this guy named Barry Louis Polisar, and you have a potpourri of eclectica and polish. The subject matter throughout pulls no punches, speaking to kids on a level most adults don’t quite understand is their natural patois, and in such endearing selections as “Never Cook Your Sister in a Frying Pan”, “I Don’t Brush my Teeth and I Never Comb my Hair”, “I Wanna be a Dog” (hey!, didn’t Iggy already nail that one? –yep, and the very savvy Radioactive Chicken Heads even cover Barry’s ditty like the Stooges), and various other gulp-inducing poetry guaranteed to make the dinosaurs around the house blush and fidget. But there’s likewise quite a few thoughtful ruminations, including anti-war cuts and homilies, not to mention more than one tongue-twister (c’mon, you ‘member how much you loved that stuff before the hormones hit and wonderland got left behind–though even the adult estate is well served by a buncha cool love songs). The musicianship and vocals are stratospheric, the whole vibe stuffed full of fun and jokestering, and nary a moment passes that you’re not wallowing in a surfeit of memories ‘n grins. So, lemme warn ya, brothers and sisters, this way righteous set of 60 songs was meant for kids even though it was created by rollicking adults!!! Also check out contributions from The Boogers and Key Wilde & Mr. Clarke. The highlight (for me, at least) is from The Radioactive Chicken Heads. They have two songs on the album, but the better of the two is “I Looked Into the Mirror (What Did the Mirror Say? )” This is an amazing collection of brilliant talent performing songs from one of the best songwriters around. Dave Loftin reviews music for Chattanooga Parent Magazine and is the host of The Saturday Morning Cereal Bowl Radio Show.